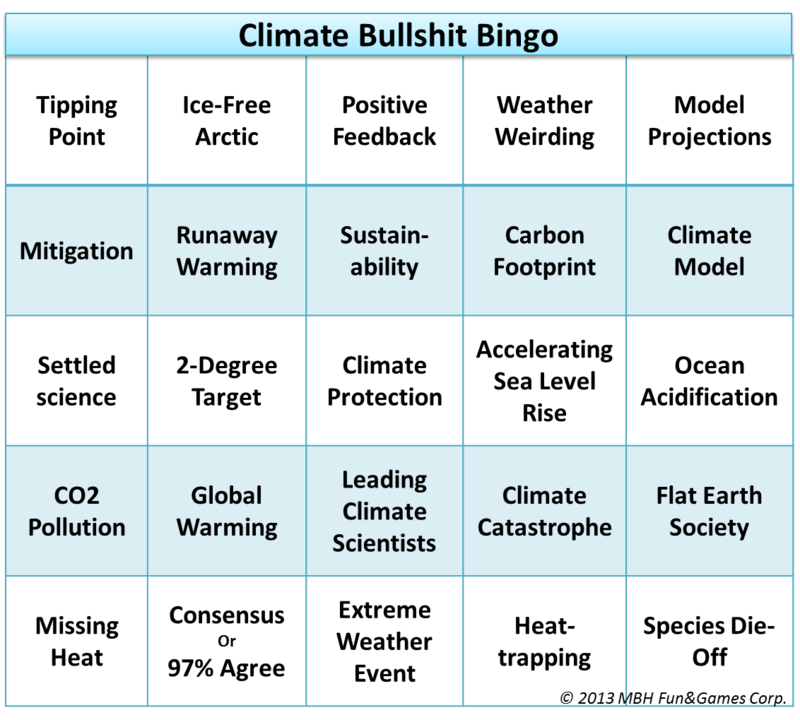 Whenever you here one of the climate buzzwords on the card above, check it off and call out “Bingo!” as soon as you have a row of five in any direction. Play it with your friends at the next conference or speech (be sure to use different cards). – Seth B., Washington D.C.
– Marc M., Washington D.C.
One is too easy. I suggest five in a row. Thanks Ed, I forgot to check the rule book. – fixed. Arnold the 13-year old nerd inside my head says you have to get a whole row, column or diagonal filled before you yell “Bingo”, or you’re a dirty rotten cheat. When I asked him, what if they made different rules for this version, he rolled his eyes and stalked off, insulted. I do think he has a point. Peter Gleick promotes photo of melting traffic light; thinks it’s Global Warming; gets corrected. I bet enough journalists fell for that. Poland has failed to stop CO2 backloading! To create the illusion of democracy, they occasionally vote down a measure on first reading, and rubberstamp it on the second. Some folks have waaay to much free time. Actually warmest speech writers use a 3 column list with directions to pick one from each column. Occasional sentences may use only 2 columns. Great humor to get ready for the 4th, Pierre! The ex-pats living here celebrate it. I’ll have the flag out tomorrow. I belive they have a very long 3rd of July and then go straight on to the 5th. Don’t ask me why though!!! Change “Missing Heat” to “Deniers”. It’s on the other bingo cards. Has this been pierre reviewed?